Romania is situated in southeastern Europe and shares borders with Hungary, Serbia and Montenegro, Bulgaria, the Ukraine and the Republic of Moldova. With a land area of more than 238,000 km², the ‘land of fairy tales’ is Europe’s twelfth largest country. Romania’s Black Sea coastline is approximately 240 km in length, and the diverse shoreline is a popular destination for both locals and foreign tourists. Dracula is among the most famous ‘people’ from Romania, in addition to the communist dictator Nicolae Ceausescu, former gymnast Nadia Comăneci, Gheorghe Hagi (Romania’s legendary football player), amongst others. 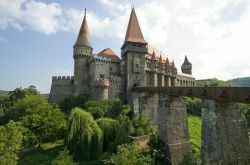 Romania is famed for its fabulous mountain landscapes, salt mines, marvelous churches and castles, and of course the historical region of Transylvania. All forms of gambling are legal in Romania, and games of luck are deeply ingrained in the culture of the southeastern European country. Locals can choose from multiple land-based gambling facilities, alongside a wealth of gaming machines at numerous establishments. Sports betting is another popular leisure activity, and also fully legal in Romania. The Romanian Gaming Commission is the authority responsible for licensing online gambling sites. Currently, all online casinos on the Romanian market are headquartered and operated outside of Romanian boundaries. Romania is also known for being a multilingual country, although Romanian is the country’s official language. Aromanian is one of many prominent minority languages, alongside several Slavic, Germanic and Turkic languages. Additionally, a significant portion of the Romanian population speaks Ukrainian, Serbian, Slovak, Bulgarian, Czech, or Polish. The economy of the mountainous Central European nation is developing quite well in terms of gross domestic product (GDP) growth. After a 0.6 percent expansion in 2012, growth accelerated to 3.5 percent in 2013. The Romanian GDP expanded by 5.2 percent last year, making it one of the fastest growing economies in Europe. According to estimates by the European Commission, Romania’s economy will grow by 3.9 percent this year. The unemployment rate remained steady at 6.8 percent both in 2014 and 2015, while inflation dipped into negative territory in 2015. At the same time, foreign investments increased by 7.7 percent in 2015, after a 3.1 percent surge in the previous year. Poverty remains a huge challenge for the government of Romania as more than 25 percent of the population lives in relative poverty. Between 2000 and 2007 however, absolute poverty decreased significantly. With more than 11.2 million individuals using the world wide web, Romania’s penetration rate has soared to 58 percent. The current mobile internet penetration rate of 44.3 percent is expected to reach about 54 percent in 2021. If you combine these data with the locals’ weak spot for gambling and betting, it’s not surprising that online casinos are extremely popular in Romania. How to deposit money in an online casino when I’m from Romania? Feel like exploring the exciting world of online gambling after reading our “online casino Romania” page? Sign up with Royal Panda and enjoy a generous 100% welcome bonus.